Al fresco dining is unlike anything else—food simply tastes better when fresh air and good company surround you. 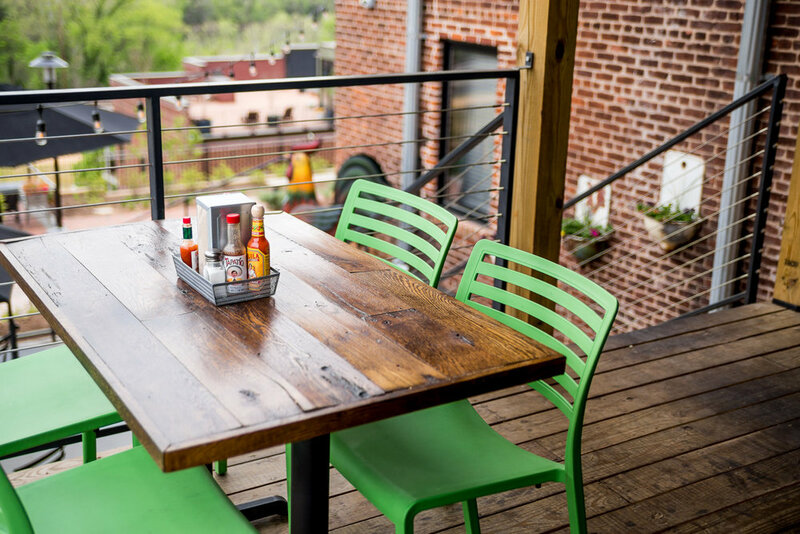 So we’re making the most of the few summery weeks remaining by visiting these 10 Downtown Lynchburg eateries with outdoor dining. From expansive river views to more intimate streetside dining, and with plenty of live music and local color thrown in as well, our complete list of downtown outdoor dining has us already anxious for our next meal. 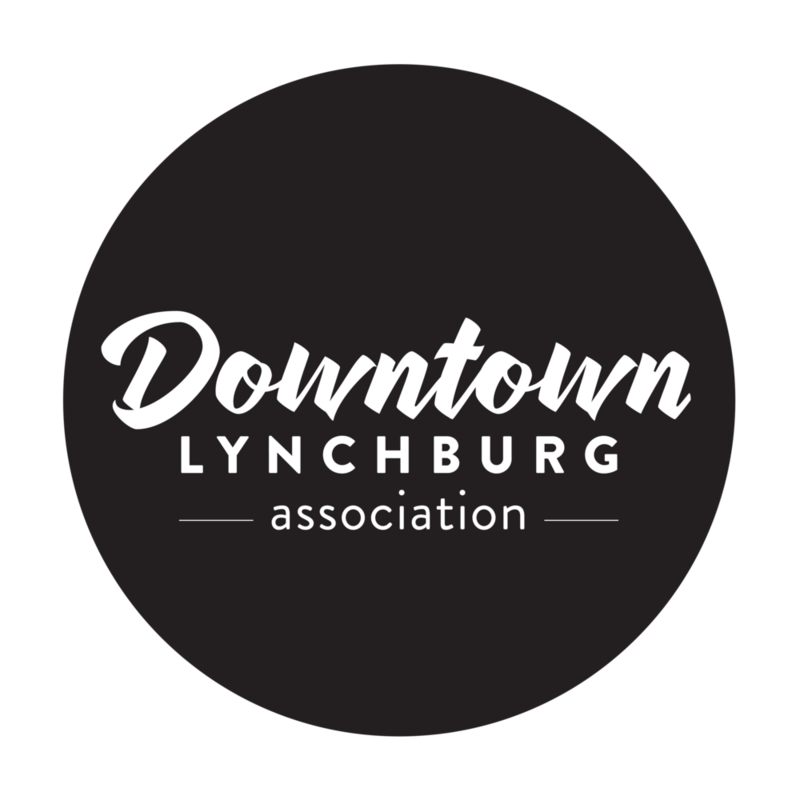 Share your favorite discoveries—dishes, views, company—using #DowntownLynchburg. 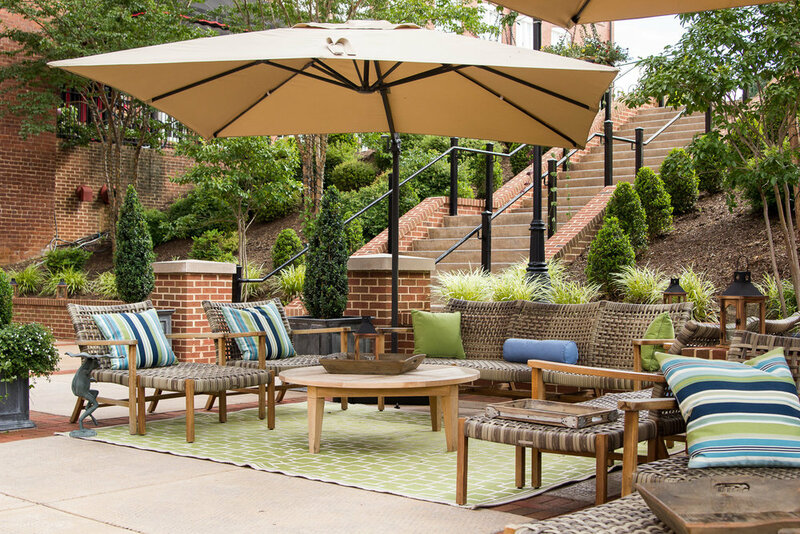 If you haven’t ventured out to Waterstone’s back deck, you’re certainly missing a unique experience. With views of the downtown bike trails, train tracks, cobblestone streets, and general passersby, you’ll enjoy the energy and great food found here on Jefferson Street. The classic option at Waterstone is, naturally, the artisan pizzas, but the variety of sandwiches and salads offered all complement the bar menu as well. Whether grabbing a quick bite midday or looking for a more leisurely evening meal, you won’t be disappointed. After eating, take a quick jaunt over to Lynchburg’s iconic LOVE sign for a photo. Open Sunday—Thursday, 11 a.m. to 10 p.m.; Friday—Saturday, 11 a.m. to 11 p.m.
Tequila is always a good idea (our official stance), and El Jefe has plenty to go around. Their margaritas made with fresh-squeezed lime and agave are not to be beat anywhere else in town. But even better than their extensive drink menu is their recent expansion, which offers tables on their back deck and the Lower Bluffwalk. So whether you’re relaxing after work or looking to spend a casual Saturday afternoon downtown, the only thing better than the view is the fresh food; tacos of every variety—chicken, tuna, pork, chorizo, beef, beans, etc. !—served up with ample toppings and salsas. Open 11 a.m. to 1 a.m.
Family outing, dinner with a client, first date—RA’s warm atmosphere leaves room for all possibilities. Take your pick from their side patio or back deck that overlooks the streets below and kick back with a specialty cocktail and a seasonal entrée from their modern American menu. You can sometimes catch some live music on a weekend night too. Between Sunday brunch—because $2 mimosas—and their weeknight drink specials—because $5 cocktails—there’s plenty to keep you frequenting this Main Street establishment. Open Monday—Thursday, 11 a.m. to 10 p.m.; Friday—Saturday, 11 a.m. to midnight; Sunday, 10 a.m. to 10 p.m.
Perched on the southern corner of the downtown Bluffwalk and with a view of the James River below, here you’ll find a welcoming patio with lantern-topped tables and comfortable chairs. With a classic surf and turf menu, you can enjoy the elegance of this downtown restaurant surrounded by the beauty of the outdoors. Lights overhead from the neighboring Craddock Terry Hotel create a lovely ambience when twilight arrives, so our recommendation is to pair some rich French pressed coffee and desserts with conversation among friends. If a cocktail is what you are in search of, consider their happy hour, which includes half price wine and beer from 4:30-6:30pm on weeknights. One of Lynchburg's best kept secrets, in our humble opinion. 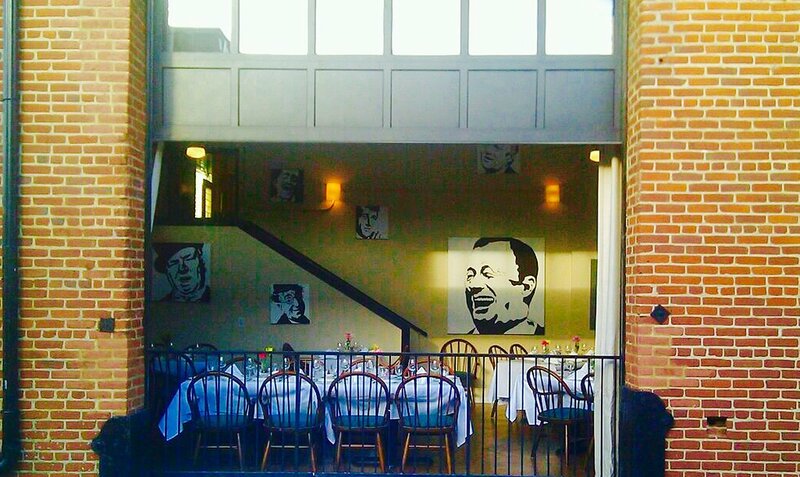 Evoking the warmth and charm of a 1920’s speakeasy, Jimmy’s is a fantastic option to enjoy open-air seating and live music. A renovated dining room transforms with the opening of a glass garage door, giving diners the experience of a street-side café. An ever-evolving menu and consistent drink specials are the highlights of what should be a musical and memorable evening on the town. Take a suggestion and stop by on Wednesdays for a true “happy hour” tasting experience; after a flight of four wines, you can purchase your top choice for only $5 a glass. Paired with an order of their decadent Baby Cakes, could you really ask for anything more when trying to survive the week? Open Monday—Saturday, 5 p.m. to 10 p.m.; lunch offered Monday-Friday. One of the newer additions to the scene, Kegney Brothers has brought a much-needed pub atmosphere to downtown. We love Kegney for its unique character (origins dating to 1879! ), its love of all things Irish, its hearty and delicious food, and especially for the late hours and rooftop patio with views of the James River. From Guinness to specialty cocktails, pub fare to tikka masala, you won’t soon forget an evening spent here at the heart of Main Street. Open Monday, 3:30 p.m. to 2 a.m.; Tuesday—Sunday, 11 a.m. to 2 a.m. When a train rolls into town, you can't help but stop to watch and listen. 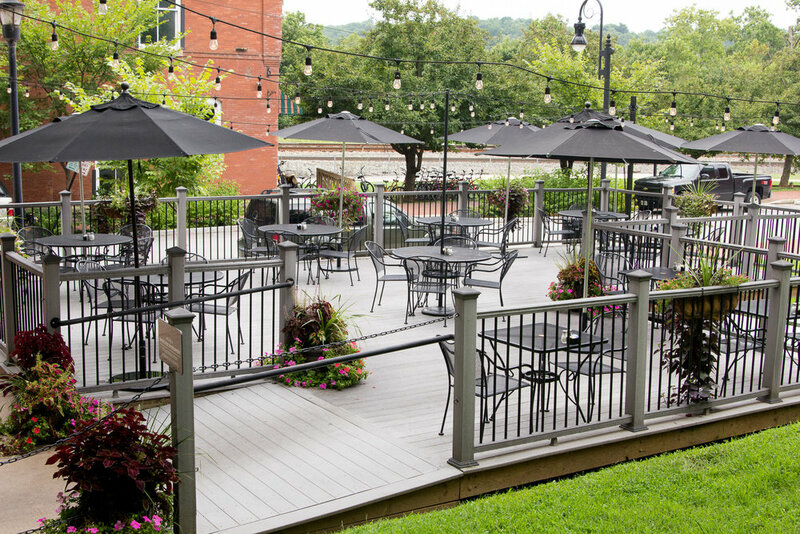 On the spacious deck of Depot Grille just a stone’s throw from the edge of Riverfront Park, you not only get a great selection of local brews , you also get a dose of history and a front row seat of the locomotives as they pass through town. Enjoy the shaded view and friendly ambience while sampling a variety of entrees from seafood and steak to pasta and burgers. Plenty of weekly specials—plus once a week All You Can Eat Shrimp feasts—mean you’ll have to visit more than once. Open Monday—Thursday, 11 a.m. to 10 p.m.; Friday—Saturday, 11 a.m. to 11 p.m.; Sunday, 11 a.m. to 9 p.m. The Lynchburg Community Market is a local institution. As one of the oldest continually running markets in the country, The Lynchburg Community Market is not just your source for local produce, but for great prepared food as well. The beauty of this establishment is that you don’t have to choose just one dish; you can have some of Lorraine’s popular crepes and a heaping platter of southern fare from Irene’s, all while enjoying some fresh coffee and pastries on the side—no judgement here! We recommend sitting outside by the fountain where you will most likely meet some of your fellow foodies. Picnic tables are also available. Open Tuesday—Saturday, 7 a.m. to 2 p.m.
Not too long ago, this Main Street charmer had closed its doors only to be reopened via community efforts. Now, it’s once again a testament to good coffee, good conversation, and good food. Its back deck has a casual vibe with solid, wooden furniture in the form of gliding benches and pub tables with warm lights overhead. You may be happy with a house-roasted coffee, but keep in mind that they serve up some tasty entrees, satisfying apps, and an assortment of beer and wine as well. Open Monday—Thursday, 7 a.m. to 10 p.m.; Friday—Saturday, 7 m. to 11 p.m.; Sunday, 10:30 a.m. to 4 p.m. Housed on the main level of the Bank of the James building, Cafe Bliss is building a name for itself with fresh and decadent sweets like raspberry bread pudding and crème brulee pie from their sister shop Montana Plains. Serving up Trager Brothers Organic coffee drinks, this cute little shop delivers an afternoon pick me up with a front row seat to the happenings of Main Street. Follow them on Facebook to keep up-to-date with their rotating menu of sandwiches, wraps, soups, and entrees. Monday—Friday, 7:30 a.m. to 6:30 p.m.; Saturday, 7:30 a.m. to 6 p.m. 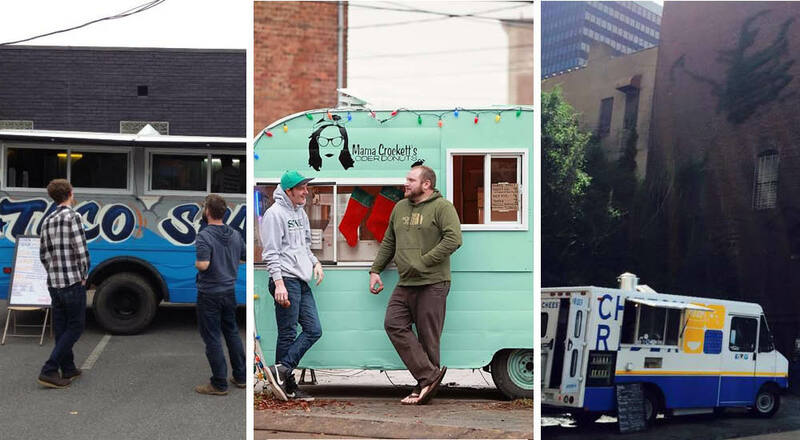 If you’re looking for some spontaneity, hit up one of Lynchburg’s many food trucks, serving everything from inventive grilled cheese concoctions to stuffed gyros drizzled in tzatziki sauce. And take an insider’s tip: you may want to save room for a bag of hot apple cider donuts as well. 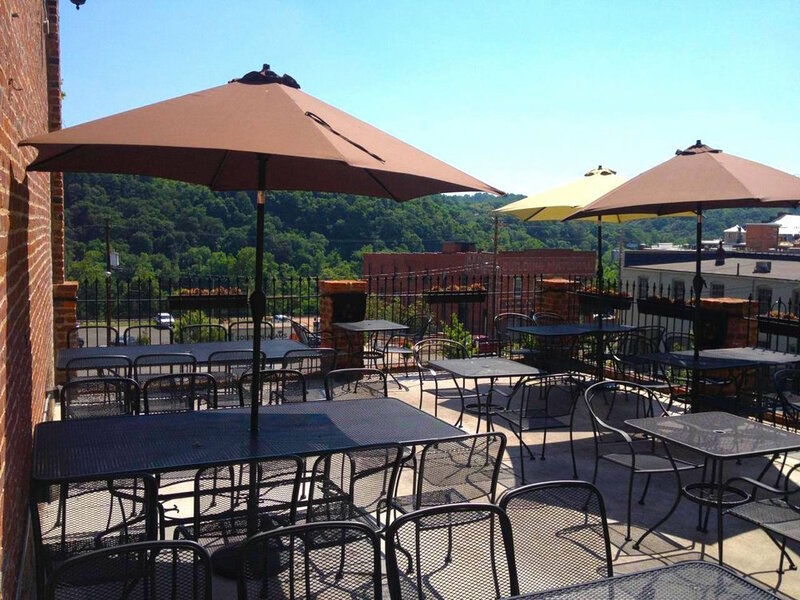 Our recommendation is to enjoy your food with a great view from the Monument Terrace steps or to have an easy and quiet picnic at Riverfront Park.